A large and vigorous tropical low, Invest 91E, will likely become the next named storm in the E Pac this week. Presently located near 8N 124W, Invest 91E appears to have the best chance of any system so far this year to cause considerable problems for Hawaii. Still a long way away, there is some discrepancy as to its initial and forecast strength, with models that identify a stronger low tending to recurve it northward prior to crossing Hawaii's latitude. Title changed to reflect upgrade to named storm status. Title change to reflect upgrade to hurricane status and official forecast track. 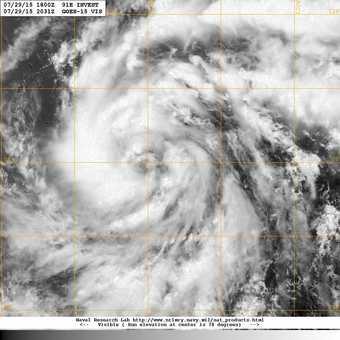 Invest 91E has been officially designated as a Tropical Depression tonight, with winds of 35MPH. As the NHC notes in Nine's first advisory, this could be conservative. The initial official NHC forecast calls for Nine to strengthen and become a hurricane on Friday. Later in the period, Nine is forecast to turn poleward and encounter decreasing SSTs and increasing westerly windshear, which should induce a weakening trend should Nine follow this track. The GFS and ECMWF prefer this poleward solution. Alternately, the Canadian, UKMET, HWRF, and NAV take Nine on a more westward trajectory, keeping the cyclone over much warmer waters longer, and ultimately placing the Hawaiin islands at greater risk. TD NINE-E has become Tropical Storm Guillermo, and the title of this thread will be updated to reflect this. The last time the name Guillermo was used, 2009, it did not get named until August 12th. 2009 Guillermo went on to become a powerful Category 3 hurricane. Guillermo becomes the seventh named storm to form in the East Pac before July is even through this season. Even more impressive, Guillermo becomes the tenth named tropical cyclone when including the three that were named in the Central Pacific so far this year. The most recent official NHC forecast calls for Guillermo to intensify into a hurricane, and then weaken a bit as it draws closer to the Hawaiin islands. Recon is being scheduled to fly missions into and around Guillermo over the next several days. The current forecast for Hurricane Guillermo calls for weakening on approach to the Hawaiin islands, but this can be dangerously deceptive. The islands are mountainous, so even if the cyclone weakens as forecast below hurricane status at the surface, winds blowing through the island chain's hills and mountains may be stronger, even by as much as a category or two. Of great concern throughout the islands, including the lowlands, is the potential for serious flooding. It may now be a good time to start taking preparations to protect life and property as a precautionary measure. A. FIX MISSION FOR GUILLERMO AT 03/1800Z NEAR 16.5N 146.5W. B. BEGIN 6-HRLY FIXES AT 04/0600Z NEAR 17.0N 148.0W. C. NOAA G-IV SYNOPTIC SURVEILLANCE MISSION FOR 04/0000Z.